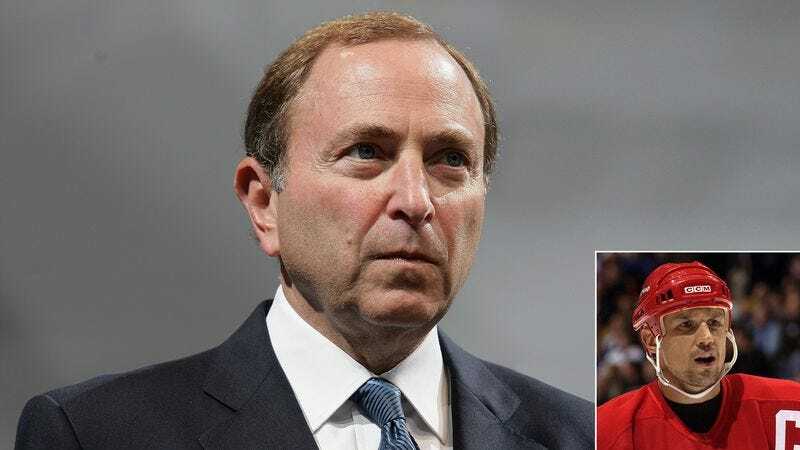 NEW YORK—Acknowledging that the referee’s original ruling represented a grave miscarriage of justice, NHL commissioner Gary Bettman issued an official pardon Thursday to former Detroit Red Wings center Steve Yzerman for his 1997 slashing penalty against the Phoenix Coyotes. “Today’s decision to clear Mr. Yzerman of any wrongdoing in this incident is an important reminder that while our league’s penalty system is not perfect, it is never too late to correct our mistakes,” Bettman said during a press conference, adding that Yzerman’s exoneration was prompted by the discovery of new video evidence confirming that the 10-time All-Star never actually struck Coyotes left winger Keith Tkachuk’s stick in the second period of the January 9, 1997 regular-season game. “While Mr. Yzerman will never get back the two minutes he served in the penalty box, we can amend the record to reflect his innocence and restore his good name. It is my sincere hope that this will finally begin the healing process for him and his loved ones.” League sources confirmed, however, that Bettman plans to deny former Montreal Canadiens center Jean Beliveau a posthumous pardon for a controversial 1970 tripping incident despite a widespread petition started by the deceased Hall of Famer’s family.